I love watching good movies. And I can't help but notice those that have something to do with intellectual property or trademarks. I finally decided to compile a list of 5 movies with some great scenes about IP. The second I uploaded my video, I got a notification from YouTube that my video was blocked because it allegedly constitutes a copyright infringement. Beat the irony of that! I initiated a dispute. 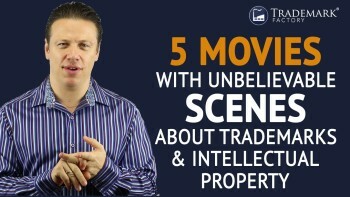 Here's a quote from my response: "This video is just my commentary on my compilation of 5 amazing movies with scenes about intellectual property and trademarks. It does not undermine the rights of highly respected copyright owners. It does not replace the actual movie. Only short snippets were used—and only as illustration of how intellectual property disputes are depicted in motion pictures. I give a disclaimer at the beginning of the video and sincerely recommend that the audience purchase a legitimate copy of the whole film. I would greatly appreciate if you agreed to unblock the video. I was an intellectual property lawyer for over 21 years and have utmost respect for others' intellectual property. I'll happily add whatever copyright notice you'd request in the description of the video. Andrei Mincov." Next morning, I received a notification that the video was unblocked and ready for your viewing pleasure. Watch it at http://snip.ly/qtapo and let me know your favorite scene!